Absolutely adorable. Patrick is a charming story that will capture your heart. Sarah Francis (Beattie Edmondson) is about to have her life changed – by a dog. When her grandmother dies, her beloved and very spoiled pug named Patrick is bequeathed to Sarah. Sarah has no time for a dog, but she takes him unaware that he will be her salvation. Sarah’s tiny apartment, aka flat (this is a British film), is a step down for the little fellow. And there are no pets allowed there but Sarah attempts to keep Patrick quiet and well behaved. That is a tall order. Patrick eats everything and when he has to go to the bathroom, he HAS to go to the bathroom. Patrick can open the refrigerator, the garbage can, lock the car doors, and do a lot of things. He’s very smart and loveable. But it takes a long time for Sarah to warm up to this little pug. Sarah just started a new teaching job and besides dealing with Patrick – the new guy in her life, she adds two more: a vet and another dog owner. Both men meet her in the park and both are taken by her, as well as by little Patrick. So, with a new job, and having to find a new residence, not to mention having a spoiled roommate who chews everything, and two potential suitors, Sarah’s life is definitely getting busy. Audiences will undoubtedly be taken in by the adorable pooch. After all, one look at this little guy and he’ll steal your heart. But Sarah is a character that is also worthy of attention. She is smarter than she originally looks, and she is funny and like her roommate, loveable too. 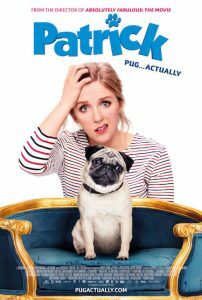 If your children watch this movie and ask for a pug, just remember how much attention they need. They are adorable and compact, but like any pet, they need to be taken care of and loved. Patrick is a fun family film not only for dog lovers, although Patrick does steal the show, but also for fans of sweet, charming movies. This is definitely a movie for the entire family. It’s rated PG but even young kids will adore watching because, well, after all, Patrick is the star. Isn’t he? Patrick opens in theaters February 15, 2019. It will definitely touch your heart and put a smile on your face.